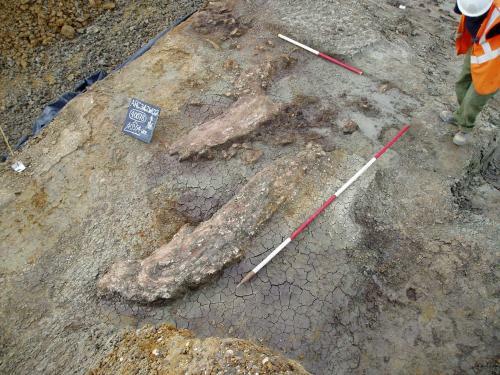 Dr Francis Wenban-Smith discovered a site containing remains of an extinct straight-tusked elephant (Palaeoloxodon antiquus) in 2003, in an area of land at Ebbsfleet in Kent, during the construction of the High Speed 1 rail link from the Channel Tunnel to London. Investigation of the area was carried out with independent heritage organisation Oxford Archaeology, with the support of HS1 Ltd. Since the excavation, which took place in 2004, Francis has been carrying out a detailed analysis of evidence recovered from the site, including 80 undisturbed flint artefacts found scattered around the elephant carcass and used to butcher it. The pre-historic elephant was twice the size of today's African variety and up to four times the weight of family car. Dr Wenban-Smith comments: "Although there is no direct evidence of how this particular animal met its end, the discovery of flint tools close to the carcass confirm butchery for its meat, probably by a group of at least four individuals. "Early hominins of this period would have depended on nutrition from large herbivores. The key evidence for elephant hunting is that, of the few prehistoric butchered elephant carcasses that have been found across Europe, they are almost all large males in their prime, a pattern that does not suggest natural death and scavenging. Although it seems incredible that they could have killed such an animal, it must have been possible with wooden spears.. We know hominins of this period had these, and an elephant skeleton with a wooden spear through its ribs was found at the site of Lehringen in Germany in 1948." An ability to hunt large mammals, and in particular elephants, as suggested by the Ebbsfleet find, would go some way to explaining how these people then managed to push northwards again into what is now Britain. The flint artefacts of these pioneer settlers are of a characteristic type known as Clactonian, mostly comprising simple razor-sharp flakes that would have been ideal for cutting meat, sometimes with notches on them that would have helped cut through the tougher animal hide. The discovery of this previously undisturbed Elephant grave site is unique in Britain - where only a handful of other elephant skeletons have been found and none of which have produced similar evidence of human exploitation. Dr Wenban-Smith explains the Ebbsfleet area would have been very different from today: "Rich fossilised remains surrounding the elephant skeleton, including pollen, snails and a wide variety of vertebrates, provide a remarkable record of the climate and environment the early humans inhabited. "Analysis of these deposits show they lived at a time of peak interglacial warmth, when the Ebbsfleet Valley was a lush, densely wooded tributary of the Thames, containing a quiet, almost stagnant swamp." The layer of earth containing the elephant remains and flints is overlain by a higher level of sediment, rich in so-called Acheulian tool types - handaxes of various forms from later in the same interglacial. Controversy surrounds whether or not these represent a later wave of colonisation of Britain, or whether the Clactonians themselves evolved a more sophisticated tool-kit as they developed a more sustained occupation.